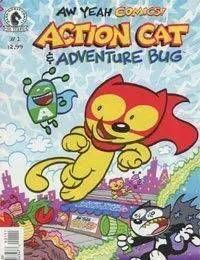 Action, adventure, and so much fun!<br />Fresh from the creative minds at Aw Yeah Comics—a brand-new series starring the valiant Action Cat and his trusty sidekick, Adventure Bug! As Evil Cat lurks behind the scenes, our heroes endeavor to bring comics to the good people of Beautiful Downtown Skokie. You better believe high jinks will ensue!<br />From Eisner Award winners Art and Franco!<br />Great fun for all ages!